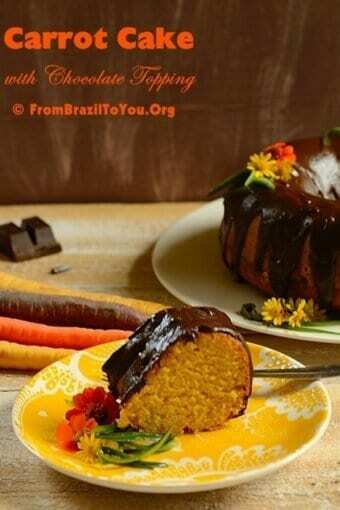 Brazilian-Style Carrot Cake quickly prepared in the kitchen blender and topped with chocolate sauce. A kid-friendly cake that also comes with useful tips for a moist cake. Carrot cake, like culture, shows differences based upon their place of origin– at least American and Brazilian carrot cakes do! American carrot cakes contain nuts and sometimes crushed pineapple and shredded coconut or raisins, adding richness to the cake by the addition of other flavorings. The Brazilian version is simpler, less sweet, and has carrots as its sole flavoring agent. 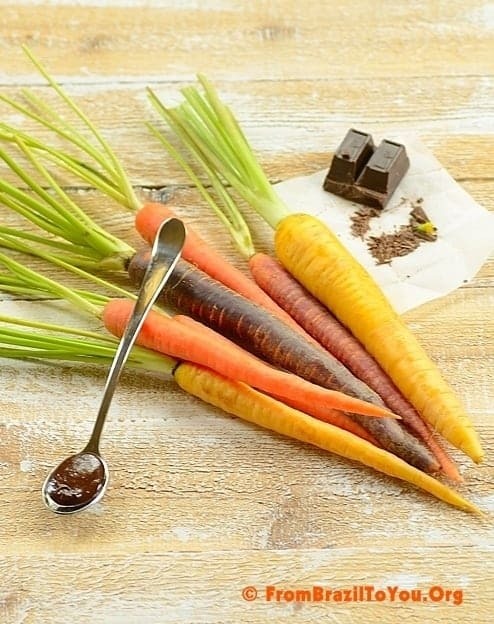 As an added bonus, Brazilian carrot cake is ideal for kids since the carrots are well blended into the cake (no visible slivers of carrot) and it is topped with chocolate sauce. The type of pan preferred for baking this cake also differs from one country to the other. 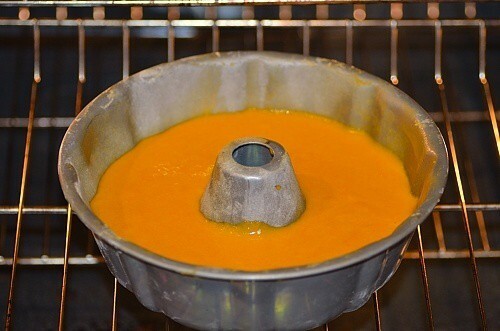 In the US, carrot cakes are often prepared in a round baking pan, a loaf pan, or even in a cupcake tin. On the other hand, in Brazil they are often baked in a ring mold or rectangular pan. Ah yes, they also differ when it comes to frosting. While American-style carrot cake is frequently topped with a cream cheese frosting, Brazilian-style carrot cake is either served plain (like a coffee cake) or more typically, topped with a chocolate sauce. I have to confess that I do prefer mine dusted with powdered sugar instead of topped with chocolate sauce. … and now that you know about Brazilian carrot cake, there is something new and wonderful for you to try on your plate, right?! Regardless of how they might differ from one another, both carrot cake versions fall into the baking category of shortened, oil cakes. For instance, this type of cake is moister and denser than those known as shortened, butter cakes (such as traditional yellow cake, marble cake, and most wedding and birthday cakes). In addition, the fat and sugar are not creamed… oil is the added fat used for moistness and density in the carrot cake. Since oils always remain liquid and never set into solid form, this type of cake can be refrigerated without losing its tenderness and moistness. Although when properly structured oil cakes are moist, butter cakes can be also. Here are a few tips to add moistness to your cakes and prevent them from drying out. Substitute a fruit puree (e.g. applesauce, pumpkin puree, mashed ripe bananas, canned crushed pineapple or plum puree) for 1/2 of the oil or butter that is called for in the recipe. The fiber in the fruit puree helps to absorb moisture and keep the cake moist. It is true that the cake will be a little denser than one without a fruit puree, but it will be moist. Add 1/4 cup of sour cream, instant pudding (the undissolved powder), or mayonnaise (the real thing) to the batter of butter cakes (Remember: butter cakes are the ones in which butter and sugar are creamed). Replace milk with buttermilk, but do not forget to add baking soda to the batter to neutralize the acids present in the buttermilk. The general ratio is 1/2 teaspoon of baking soda per 1 cup of buttermilk. For butter and oil cakes made with gluten-free flour, use the amount of butter or oil called for in the recipe and add a 1/2 cup of a fruit puree (e.g. applesauce) to the batter. If you are making a layered cake, brush the baked and cooled cake layers with simple syrup. This is a technique professional bakers use to keep the layers of a cake moist, whether the cake is from scratch or from a mix. After the simple syrup has been applied, spread a thin coating of frosting and let the frosting dry before putting on the final layer. To prevent a cake from drying out, always store it well covered. 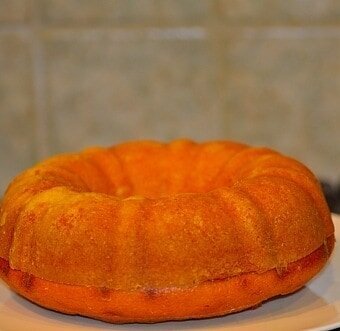 Butter cakes are best kept at room temperature, while oil cakes can be refrigerated. With all that said, let’s go to the kitchen to get this baby baked! Preheat oven to 350 degrees F (about 180 degrees C). Grease a round ring mold (9-inch or 23 cm diameter) and dust with flour. In a blender, blend the carrot, oil and vanilla together very well until the mixture is homogeneous and smooth. Reserve. In a large bowl, sift the flour and baking powder. Reserve. Using an electric mixer, beat the eggs and the yolk at medium speed until frothy (about 1 minute). Gradually add the sugar and beat until sugar has been well incorporated (about 1 minute). 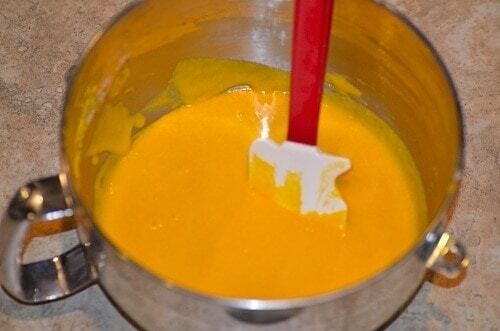 Stir in the mixture of blended carrots using a spatula. Then, add the flour/yeast mixture in 3-4 additions and also a pinch of salt, beating on low speed until the flour has been incorporated to the batter. Pour batter into the prepared pan. Bake for about 40 minutes or until a toothpick inserted in the center comes out clean. Let cool completely on a wire rack. Unmold and top with chocolate sauce. Decorate as desired. You can also serve this cake plain or dusted with powdered sugar instead of topping with chocolate sauce. This cake is moist without being oily!!! If you are intolerant to dairy, serve cake dusted with powdered sugar. To prepare the chocolate sauce: In a saucepan, combine all the ingredients and cook over medium-high heat, whisking constantly. When it starts to boil, lower the heat to medium-low and simmer until sauce had thicken (about 5 minutes). Remove from heat, stir in the vanilla extract, and let sauce cool down to warm. Pour over cake. If you love Easter cakes, try also our Easter chocolate cake! 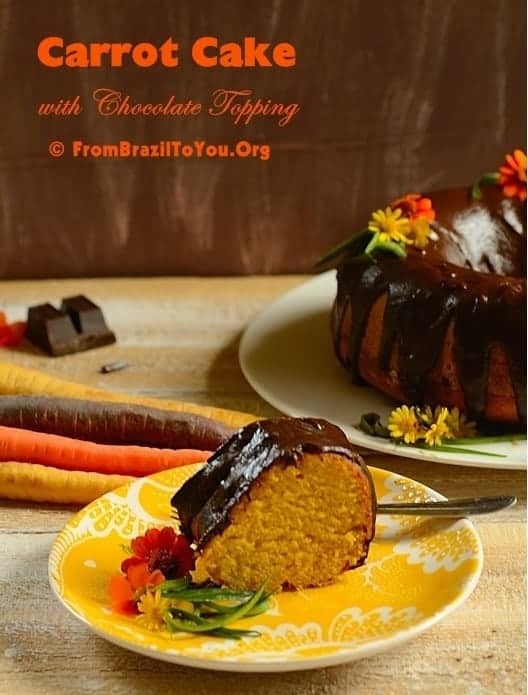 Brazilian-Style Carrot Cake prepared in the kitchen blender and topped with chocolate sauce. A kid-friendly cake that also comes with useful tips for a moist cake. Preheat oven to 350 degrees F (about 180 degrees C). Grease a round ring mold (9-inch or 23 cm diameter) and dust with flour. In a blender, blend the carrot, oil and 1 tbsp vanilla together very well until the mixture is homogeneous and smooth. Reserve. In a large bowl, sift the flour and baking powder. Reserve. Using an electric mixer, beat the eggs and the yolk at medium speed until frothy (about 1 minute). Gradually add the sugar and beat until sugar has been well incorporated (about 1 minute). Stir in the mixture of blended carrots using a spatula. Then, add the flour/yeast mixture in 3-4 additions and also a pinch of salt, beating on low speed until the flour has been incorporated to the batter (Please, do not overbeat!!!). Pour batter into the prepared pan. Bake for about 40 minutes or until a toothpick inserted in the center comes out clean. Let cool completely on a wire rack. Unmold and top with chocolate sauce. Decorate as desired. You can also serve this cake plain or dusted with powdered sugar instead of topping with chocolate sauce. This cake is moist without being oily!!! If you are intolerant to dairy, serve cake dusted with powdered sugar. To prepare the chocolate sauce: In a saucepan, combine chocolate chips, milk, 1 tbsp vanilla, butter, and honey and cook over medium-high heat, whisking constantly. When it starts to boil, lower the heat to medium-low and simmer until sauce had thicken (about 5 minutes). Remove from heat, stir in the vanilla extract, and let sauce cool down to warm. Pour over cake. 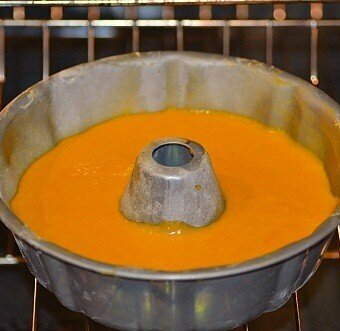 If you don't have a ring mold pan, you can bake the batter in a standard-size cupcake pan. In this case, fill 3/4 full and bake for approximately 18-20 minutes. Please, always do the toothpick test!! You can either use paper liners, or grease and dust the cupcake pan. Oi, Sally!!! Estou super feliz com a sua visita. Que bom que você gostou do meu bolo de cenoura. O bolo está quase acabando e é que fiz essa manhã. :) Essa receita é bem molhadinha. Espero que você experimente. Embora eu adore chocolate, eu prefiro o meu bolo de cenoura sem a cobertura, simples mesmo de tanto que gosto desse bolo. Obrigada por me visitar e espero que você volte sempre. Um abraço. I also see that the Brazilian recipe purees the carrot, we usually add grated. I see a lot of pluses to this cake! Looks so moist and delicious. Your photos are gorgeous Denise! Thanks, Nazneen! Yes, we pureed the carrots…and this make the cake even moister. Thanks so much for stopping by. You know what, I like the ide to blend the carrot, so it can be hidden for kids. My kids are always looking to “colored things” inside my cakes, if they find something strange, they don’t eat. Thanks for the tips to have moist cakes…very useful…!!! Thanks a lot, Nydia! I have a picky 6-year-old daughter and she loved this cake. There is not even a tiny piece of carrot appearing there. I think it is ideal for children who do not like to eat veggies. Our wedding cake was a traditional American carrot cake with cream cheese frosting. At the time it was my favorite cake. Now it tend to favor citrus based desserts or those with seasonal fruit. The Brazilian style of cake is appealing. I imagine more of the carrot flavor is apparent when not combined with pineapple, coconut and walnuts. A lovely post! Thanks, Deb! This is a great coffee cake. I personally eat mine plain or dusted with powdered sugar. Your cake is first of all gorgeous Denise, I love the way you used the fresh flowers to decorate. It also looks so moist and delicious and thanks for all the great tips! My pleasure, Chris! And thank you for your sweet words…It’s always good to hear from you. Who knew there was a Brazilian version of carrot cake? Not me! I’d love it just as you described…with a dusting of powdered sugar. Though I love the decadent American version, I’d feel less guilt and immense pleasure eating a slice of yours. Thanks, Liz! I love both the American and Brazilian carrot cakes for different reasons. I hope you can try this new version for you. Hi Denise, I remember this carrot cake from Brasil…puree carrots…yours sure look great…light and fluffy and yes, not oily at all. My pleasure, Juliana!!!! Have a nice week as well and thanks for stopping by. I love the sound of a Brazilian carrot cake! Your cake looks so gorgeous too,I love your food styling and photos! Pureed carrots! Now that’s a great idea!! The cake looks beautiful, Denise! It really does not have a trace of carrot !!! 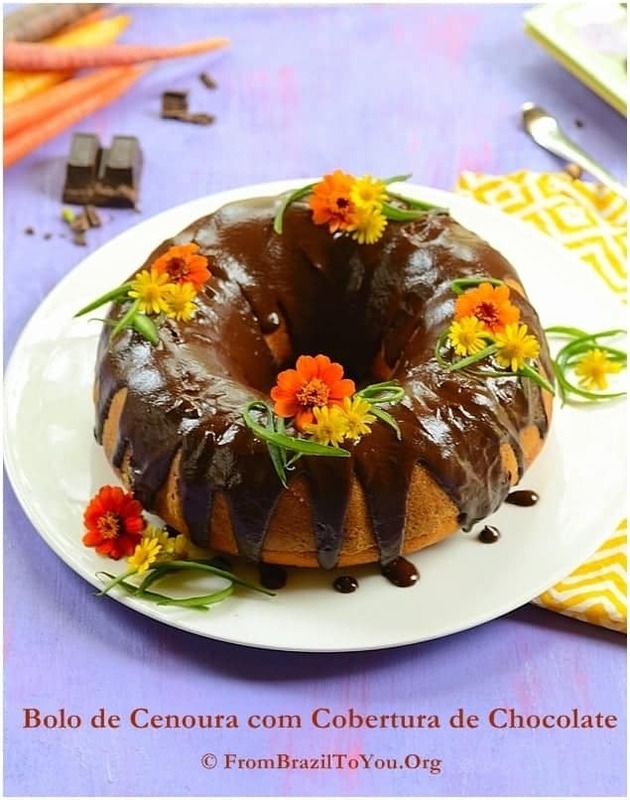 just a whole orange colored cake… I tried so hard making my kids eat the American one but as soon as they glanced the slivers of carrots they just turn their bake and say no way 🙂 and whith the addition of chocolate sauce, who can resist this ? 🙂 I will try this for sure, it almost has all the solutions to my probles in making kids eat carrot cakes. Thanks a million. 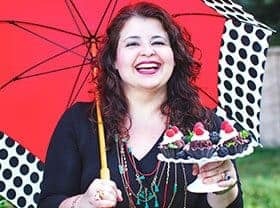 Thank you, amira, for stopping by and commenting…My 6-year-old loves this cake a lot and I hope yours enjoy to eat it as well. Denise, I seriously loved this post! The tips on how to keep the cake moist, are very helpful. You carrot cake is looking yummy! Definitely need to try this, sounds like a delicious recipe!! Thanks, Purabi! I hope you can try to apply these tips on your next cakes. They really work. Thanks for stopping by. Beautiful cake ! Love the simplicity of the recipe, too. What what great tips all collected in one place – I read every single one of them! Pinned – onto my Everyday Cakes pinboard! Thanks, Julia! I loved you Alfredo pasta as well and have pinned onto my Pasta pinboard. Wishing you a great week. The tips were very useful, Denise. My kids usually don’t eat the American version because of the shredded carrots. This recipe had carrots all blended so they ate the cake and enjoyed it. I am making this again. Thanks for the recipe.